Camille Honeycutt is lost in the past, forever the Savannah Vidalia Onion Queen of 1951, traipsing around town in old gowns from the thrift store. But it's the 1960s now, and Camille is living in Ohio with her 12-year-old daughter, CeeCee, who has been responsible for taking care of her mother for years. The embarrassment that comes with having a mother who is the laughingstock of the town prevents CeeCee from making any close friends. 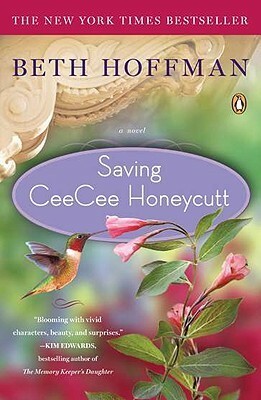 Saving CeeCee Honeycutt by Beth Hoffman is the story of CeeCee's escape from this life after the tragedy of her mother's death. She is sent by her absentee father to live with her Great Aunt Tootie in Savannah. There CeeCee begins to heal with the help of Tootie and her housekeeper, Oletta, as well as the colorful characters that live nearby ~ Miz Goodpepper and Miz Hobbs. I really enjoyed the characters in this story. They were a bit outrageous at times, but that made it more fun to read. I think it would make a great movie! Some of the issues of the times are touched on, and the issue of mental illness is explored a bit as CeeCee struggles to understand her mother and to overcome her fear that she will follow in her footsteps. But overall, this is a very lighthearted novel. It doesn't get very deep into any of the issues, and each time a situation arises, it seems that everything works itself out just fine. If you enjoy lighthearted southern fiction, this is a great choice. I would also recommend it to younger readers and those who enjoy young adult novels, even though it's not classified as such. It's very enjoyable and easy to read. This review was written based on a copy of Saving CeeCee Honeycutt that I acquired through Paperback Swap.